TAMPA, Fla. - Oct. 7, 2016 - PRLog -- St. Thomas Aquinas, located in New Port Richey, FL, continued upon its mission to better serve its community with the help of Accurate Technologies, Inc. The Parish took a step towards energy savings by upgrading to LED lighting. This lighting upgrade will reduce the church's utility bills immediately by reducing their lighting load by 75%. 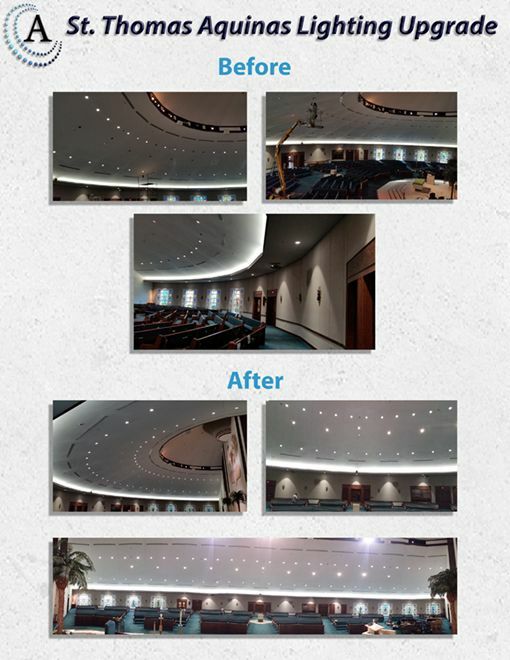 The church went from 100 watt metal halides to 27 watt LED fixtures with the help of Accurate Technologies. In addition to the energy bill savings, the church will also save money on maintenance, as the LED lighting lasts significantly longer than the previous lighting, thus reducing the need to change them as frequently. The project is a symbol of the church's commitment to caring for the environment and will allow the church additional resources to continue its mission to "Learn, Live & Share the Good News". St. Thomas Aquinas Catholic Church is structured around a transitional design balanced between contemporary themes and traditional ideas. It is situated next to the existing facilities without impacting the sensitive adjoining wetlands. The peak of the Church crests above the dense oak environment and can be viewed for miles. Visitors are welcomed through the main covered entrance into the Narthex before entering the main sanctuary. The Narthex was designed to portray the life of St. Thomas Aquinas and was furnished with a statue of the saint along with stained glass panels symbolizing his life's work. Accurate Technologies is a full service supplier of LED lighting solutions. Clients include commercial contractors, electricians, building maintenance departments and property management firms. With the latest lighting technology platform Accurate Technologies can facilitate lighting packages for many settings including: medical, retail spaces, street lighting, parking garages, office buildings, resorts, and schools. ATI can also ease the process of installation by recommending qualified technicians through its service network. Accurate Technologies focuses on highly efficient lighting technologies, but just as importantly, make sure that recommendations are visually appealing and effective for the end user. The company provides only high quality LED lighting products which have passed rigorous safety, performance and efficiency standards, and Accurate Technologies is committed to serving its clients with responsive, helpful service.